What! We trust that source? 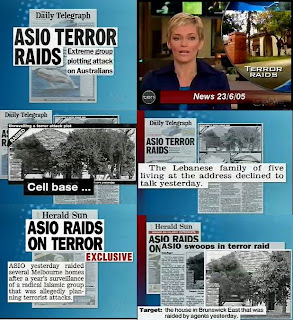 ASIO and, the Australian Federal police (AFP) and Victorian police have raided a number of properties in Melbourne in relation to the alleged 'possible' political fear campaign by hoWARd and his cronies and subsequent propaganda attacks on the community by News Ltd.
A spokeswoman for the Australian Community says ASIO and friends are in contempt of the community at large and the political fear campaign by the hoWARd government is just another political witch-hunt to scare the community. "These raids are inappropriate and show no good will by the authorities because 'ding dong' the 'wicked old witch is dead'," she said. "Furthermore, nothing is reasonable about a raid on people's homes because for an alleged possibility. For those sorts of enquiries one should approach a 'soothsayer' and if you get the all clear only then should they approach people via the front door with the appropriate warrant to search one's home. A warrant based on concrete evidence that has been filtered by a judge or magistrate of the court to see whether the material is frivolous or vexatious." It is 'believed' the fishing expedition uncovered information during a 10-month investigation, called Operation Pandanus, suggesting a group of Islamic extremists were planning the attacks. But if I believed that I was going to win the lottery next week I'd strongly suggest that that belief rests on very extremely long odds. And I certainly wouldn't pledge my freedom or liberty on the outcome of my belief and at best I would only gamble say, a packet of prawn bait on winning! The ASIO raiders are 'believed' to have interviewed up to four people in Melbourne and two in Sydney. Neighbours of a home raided at Brunswick, in Melbourne's north, said that they knew that they were fishing because "they had News Ltd written all over them" said one neighbour. I strongly suggest that the only extremist group is ASIO who no doubt attended survival-training camps in this country to carry out terrorist activity on our very own citizenry. After that sort of misbehaviour today it could only encourage someone to get angry and we have a couple of examples below. Why would an ASIO 'fishing expedition' tell 'News Ltd anything'? May I suggest that these are the only loose-links that should be discussed? News Ltd and the very radical hoWARd government in Canberra, which have apparently been using large articles for propaganda purposes to attack targets including the Australian Community with unwarranted and uncalled for baseless fears. "Authorities do not expect to lay any charges as the raids were planned to disrupt the group to avert possible attacks." GKCNN: Planned to disrupt the community more like it.
" An 'unnamed' source told the newspapers the targets had "shown a real intent to do something". GKCNN: But we know the sources name stupid it's 'john hoWARd' and his mate 'phillip ruddock' with tomato sauce dripping down their ugly faces. "They are talking a lot about terrorist attacks overseas and expressing extremist view, and talking about doing something here to show support for those Islamic groups committing terrorist acts elsewhere," the source said. GKCNN: With that sort of offensive behaviour by "authorities" is it any wonder! The underlying concern of this book is the issue of balancing the needs for national [in]security [because of the resource wars in the Middle East and the occupation and genocide in Iraq and Afghanistan and now a reduction] with individual rights and freedoms. Author Jenny Hocking argues that, in the light of [USA, CIA, false flag operations] September 11 and [CIA] Bali [Call to Arms], the [in]security legislation proposed, and in part passed, by the [criminal] Howard government compromises the separation of powers and individual legal and political rights. 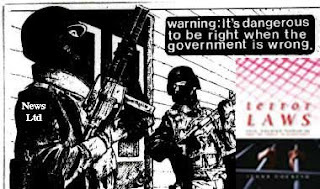 The theme extends throughout the book, and her discussion of the establishment and history of ASIO [false flag operations and the Hilton Bombing] gives context to current debates. Newspaper bullies destroy people's lives! NSW: Who's policing corporate media? Have police the means to prosecute them? Have you been a victim of newspaper abuse? Please make a comment and send your complaint to the Daily Terrorist, the police and ATTORNEY GENERAL Bob Debus! Who owns media ethics? Zoom Zoom Zoom? The Federal Government will reopen negotiations with key independent senators, in a bid to win their support for an overhaul of Australia's media ownership laws. How the Daily Terror seduced an Aussie public? ALLEGEDLY MELANIE Brown was a highly trained military Arabic language expert and a fresh convert to Islam when she was seduced into marriage by Frenchman Willie Brigitte. Federal Attorney-General Philip Ruddock wants to strengthen Australia's terrorism laws, to make it easier for the Australian Security Intelligence Organisation (ASIO) to hold and question suspects without any evidence for three years and ban organisations.